Jingle Bells Jerusalem! A huge, glittering, festive and colorful Jerusalem Christmas Market. Will take place at the New Gate (Collège des Frères), Muristan and Nablus Road, on Saturday- Tuesday, 15-18 Dec 2018, 4: 00-10: 00 PM, entrance is Free. Towards the end of the year, Jerusalem sparkles with lights Christmas trees and festive atmosphere and lights decorations in and around the Old City. The picturesque alleyways of the Christian Quarter from the New Gate to the Muristan will be decorated with special holiday decorations and fireworks for the opening of the Market and Sylvester, a huge Christmas tree at the New Gate, Santa Claus / Papa Noel will open his house, Gift stand, holiday delicacies, shows for the whole family. 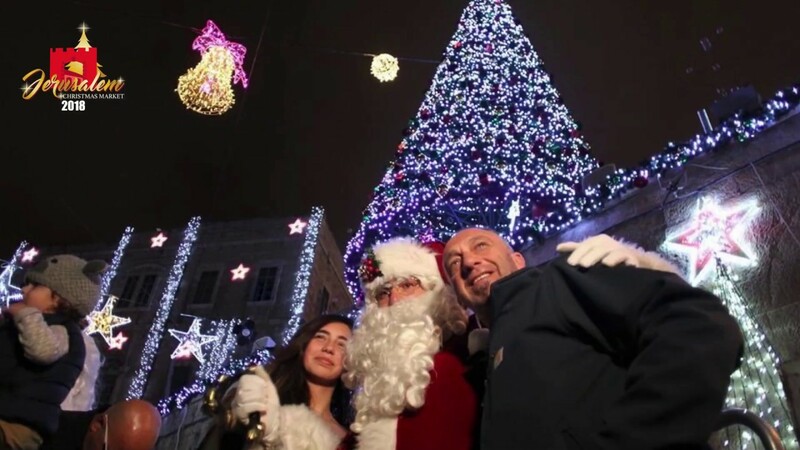 Christmas Market 2018 is held at the initiative of Lights Up Ltd. and the Bozoor Elhayat Lapdal Association in cooperation with the merchants of East Jerusalem. The Christmas Market opening event is the lighting of a giant Christmas tree decorated with 30,000 light bulbs and 3000 holiday balls, a firework shows and a musical performance. The event will be broadcast live on Facebook. Christmas Market at Collège des Frères and the Muristan. A children’s party in the courtyard of the Freire School includes inflatable games, children’s games, a DJ, clowns and a gift distribution for children. Christmas Market at Collège des Frères and Muristan. Bring the cameras! – The official Santa Claus of Jerusalem opens his enchanted and decorated house to the public, St. St. Peter 2. Free entrance. Christmas Market at Collège des Frères and the Muristan. Children’s performances on the main stage at Collège des Frères and distribution of presents for children. Music, countdown and a spectacular firework show at the New Gate!